Commercial power washing, even if you&apos;re leasing a property, can be extremely beneficial to your business. You want your business to look respectable, and you want people to identify with your brand positively. Pressure washing the exterior of a business, walkways and the parking lot can go a long way. Think about how much dirt and grime can build up over the years. As a matter of fact, you don&apos;t want to wait years to power wash a commercial property. If you do, it will have deteriorated to a certain point, making the job even more difficult. When more needs to be done, that costs you more money. Plus if you wait too long, then your business isn&apos;t going to look very attractive in the meantime. It&apos;s more than just about making your property look good. You also want it to be healthy and safe for your customers. Think about the exterior of your property being hygienic, and consider the fact that mold and mildew can build up over time. You don&apos;t want to allow that to happen whatsoever. When you have a commercial building pressure washed regularly by a professional power washing service, you can focus less on the actual upkeep of the building. You can address concerns after each pressure washing, and the building should stay in better shape. That will mean less costly projects and not as much to do in terms of repairs. If your business gets lots of customers, that&apos;s quite a few people pulling in with their cars each and every day. Vehicles leak fluids, and those parking lots can start to look a little worn and torn. With that being said, the parking lot is usually the first part of a commercial property that starts to show signs of wear and tear. In other words, it is what can signify to you that it&apos;s time for a power washing. When you have the parking lot pressure washed, you might as well address the entire building. Those walkways can also become &apos;worn and torn&apos; looking quite quickly, too. 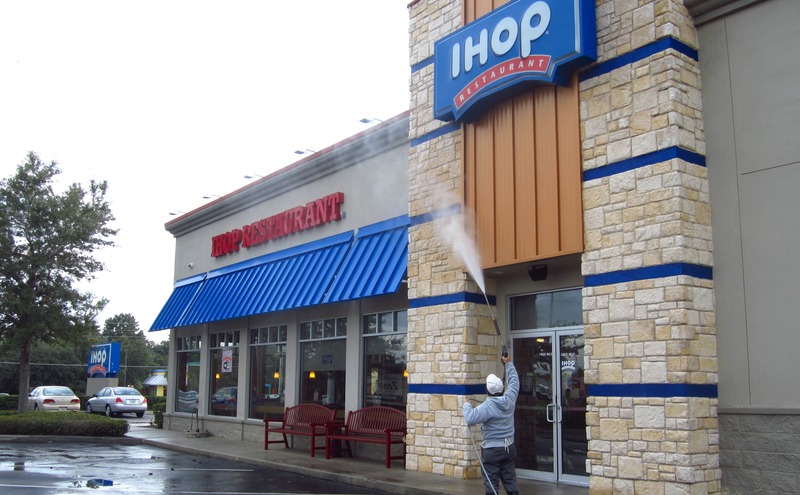 Power washing the building and the rest of the property not only keeps your business looking good to the public, but it keeps the property value on the rise. Property upkeep and maintenance is important, and you want to be sure that you are addressing all the issues. Another option is that a commercial building can also have the roof pressure washed and then have possible repairs made. You just want to be sure that the actual power washing of the roof doesn&apos;t cause any extra damage. When biodegradable cleaners are used, you don&apos;t have to worry about the landscaping of your commercial property. In fact, you might want to check on that so that you can feel better about your environmental responsibility. It&apos;s something that I didn&apos;t even think about until I started looking more heavily into power washing. One thing for sure is that there are many advantages to pressure washing your commercial buildings. Now that you know more about your options, please feel free to call today to schedule. Beauchamp Powerwashing at (850) 602-5320.